Lewis Brinson has underwhelmed during his time in the majors. Despite dominating AAA competition (wRC+’s of 163 and 146 across two stints), he has struggled to find his stroke against MLB pitching. As a highly-rated prospect, Brinson provided power, speed and defense in a unique combination in the minors – a desirable trilogy of skills. He has played closer to his floor than his ceiling, though, since debuting in the majors. Using both FanGraphs and Statcast data, obtained the morning of June 8th, as well as video, I sought out to try to find a fix for Lewis Brinson. In Brinson’s initial cup of coffee, in 2017, he ran a rough 30 wRC+ and .225 wOBA in 55 PA with the Brewers, according to Fangraphs. After being traded to the Marlins, Brinson rode a solid spring training performance (.328/.365/.586) into a starting center field role, having appeared to turn a corner after 2017. Since the season began, though, Lewis Brinson began to perform like it was 2017 again. Through June 7th, he’s batting .168/.214/.313 with a 32.1% K-rate and a measly 4.1% BB-rate, good for a 41 wRC+, second-worst among qualified batters. His Fangraphs prospect tools, seen below, suggest he is much better than his current performance indicates. Lewis Brinson was a top prospect in the minor leagues, peaking at 13th on MLB.com and FanGraph’s prospect rankings lists as some point within the last year. Brinson’s tools are promising. Essentially, he was seen as a power hitting speedster with a strong arm, average to above hands and fielding instincts, and a below to average contact ability. In the majors, Brinson has displayed above-average fielding and great to excellent speed – 29.5 ft/sec sprint speed, 8th at his position and 44th in the majors – but has yet to flash his game power and has mightily struggled with contact, to the point where it may be masking his power. When he makes contact, like in AAA, he displays uncanny offensive abilities: .343/.392/.575 with 17 home runs and 15 stolen bases in 433 PA, with a 19.2% K-rate and 7.9% BB-rate. One of the major areas of concern for Lewis Brinson is his ability to make consistent contact. Specifically, he has had a hard time getting under the ball, too frequently hitting the top instead. As seen below, his Statcast data suggests he has a flat swing, as opposed to the slight uppercut many pros pursue. Brinson hits too many ground balls and topped balls, resulting in a low launch angle. Higher launch angles could help him utilize his natural power. I felt Dexter Fowler was a decent comp to use for Lewis Brinson because of his similar body type and skill set. Brinson is 6’3″, 195lbs. and Fowler is 6’5″, 195 lbs. During the 2016-2017 seasons, Fowler displayed similar power and speed numbers to Brinson’s AAA performance. Given that similar power and speed profile, I chose to compare Fowler’s 2017 season’s launch angle distribution to Brinson’s. Below are both of those distributions – on the left, Lewis Brinson’s 2018 season and on the right, Fowler’s 2017. Clearly, Dexter Fowler capitalized on productive launch angle zones. Ideal launch angles are between 10 and 20 for line drives and 20-30 for fly balls (wide estimates, but they paint the right picture). Lewis Brinson, however, struggles to find those optimal launch angles. His launch angle distribution reflects that – the majority of his batted balls are hit into the ground, at launch angles at which balls rarely becomes hits. Given his 6’3″ 195 lb. frame, Brinson struggles to make contact with pitches low in the zone. Below is a Fangraphs heat map of contact rate per area of the strike zone. On the left is Lewis Brinson’s 2018 contact rate. 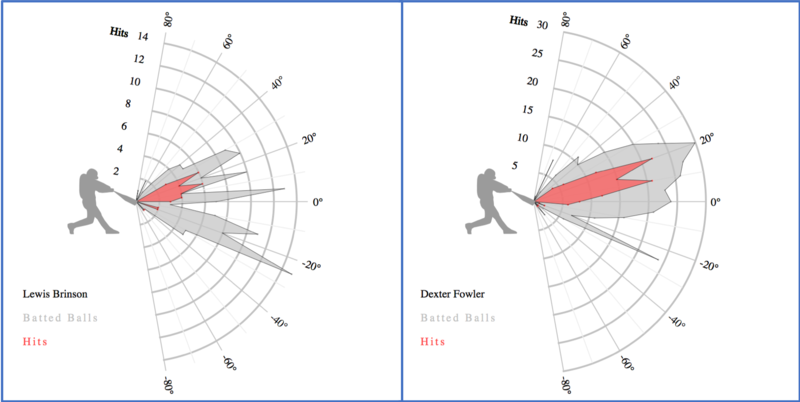 On the right is Dexter Fowler’s right handed contact rate from 2016 and 2017. Lewis Brinson clearly struggles with low pitches, especially on the corners. Compare that to a 2016-2017 right-handed -batting Dexter Fowler (who ran a 120 wRC+ with a .355 wOBA), and you see the difficulties Brinson has had with making contact. Part of this surely is because Brinson is a rookie and needs to acclimate to MLB pitching. The likely cause, though, is his swing, which we can break down over time. Through browsing the video archives (translation: Google Search Engine), I came across three separate swings Lewis Brinson has deployed in recent years, with varying success. The first swing was from his 2016 AA stint with the Frisco Roughriders, while the other two are both from 2018 – April 21st and May 4th. The three clips I chose are of home runs, with two of them (AA and May 4th) having the pitch in the same location. For convenience, here are gifs of each swing. A few key details to notice. Brinson starts his leg kick before the pitch is released, . He also has a slight drop in his hands, a timing or loading mechanism for his swing. Also, from this perspective, we can’t see Brinson’s back knee until the moment he makes contact. We can see quite a bit of his jersey number, implying a strong turn and load. Here, Brinson is using a different leg kick. He lifts it prior to release, but earlier than in AA, and holds his leg in the air a bit. He’s removed the depth of his hand movement in loading, as well. Even though it is a different camera angle, it’s clear that Brinson’s back leg is exposing itself prior to contact. Not as much of his jersey number is exposed on his turn, though some of that could be camera angle differences. In his most recent swing, only a few weeks after the April 21st swing, Brinson has reduced the magnitude of his leg kick. He starts his kick as the ball is being released, but uses a few leg movements prior to the release as a timing mechanism. Similarly to the previous swing, Brinson has reduced the magnitude of his hand drop and exposes his back leg prior to impact. Despite an aiding camera angle, not much of his jersey number can be seen. Upon first view, I felt like the 2018 swings lacked athleticism which, for such an athlete as Brinson, is suboptimal. It appears that his upper and lower bodies aren’t working as one – exposing his back leg prior to contact implies he is opening up too early, even if his hips don’t appear to do so. These swings can be viewed as a one-two swing, where his lower body fires and then upper body, in a one-two sequence. By removing his hand drop, Brinson may have thrown off his load timing. Whether this is affecting the timing of his leg kick, or if the timing of his kick is conscious, is unknown, but his leg kicks in 2018 also appear suboptimal. Neither the larger, hanging leg kick nor the on-release leg kick appear to help his timing. Brinson appears to lack a deep load – even with an off-center camera angle, not much of his back can be seen, implying his shoulders aren’t in a powerful location during his load. Compare his 2018 swings to a 2017 Dexter Fowler home run swing. Despite it being a left-handed swing, differences are immediately apparent. While Lewis Brinson is starting his current leg kick upon pitch release, Dexter Fowler is almost finishing his leg kick then. This allows Fowler to load into an athletic position, with his shoulders and hips turned, exposing most of his jersey number despite us having a camera angle that would hide his back. Fowler drops his hands upon loading, moving them back which supports his athletic load and turn. Despite starting in a slightly open position, Fowler doesn’t expose his back leg until impact or even slightly after. His upper and lower body work together, in sync as opposed to sequentially. Fowler’s swing here is explosive. We can identify a few swing fixes we can suggest to Brinson, based on our swing breakdowns. The first would be his load mechanism – previously, he used his hand movements to load his swing into a turned, athletic position, while timing his swing with a small but effective leg kick. By trying to remove his hand motion, Brinson lost his deep load. Changing his leg kick led to a loss of timing, breaking the athletic chain and resistance his swing needs for coverage and power. These two changes broke the synchronization between his upper and lower body, which makes both contact and power more difficult to find. Brinson is very athletic – he likely has been relying on his athleticism more than his swing as of late. How could these changes help Brinson? They could help put his swing in better positions to cover the lower part of the plate, and to cover the entire plate with greater efficiency. The quality of his contact could increase, as he gets his entire body working as a single, power-transferring unit. With better quality contact, he could get under the ball and square it up more, driving it along ideal launch angles and utilizing his natural power. Or, these changes could hurt him. As with many sports, fixes that may help some may not help others.Whatever Brinson is trying, though, doesn’t seem to be working. We hoped you liked reading Can we Fix Lewis Brinson? by tb.25! Update: In his great performance against the Giants last night (6/11), two of the three key swing changes I suggest appeared fixed. In the video of his triple from MLB.com, you can see he both starts his stride earlier and he allows his hands to drop and load. His hips still open up early, but that may just be trait he sticks with until he has an offseason to work on it. Brinson’s natural power compensates, for now, for this upper-lower body disconnect. Yea, his issue has always been his hit tool, which has been exposed at the major league level. Fiddling with his swing hasn’t helped, either. Loading too slowly, with the way he has been opening early, I think threw his timing off (re: the April 22nd GIF). He hasn’t been allowing himself (whether his choice or the org’s) to load like he used to, which in my opinion prevents him from staying closed through the swing.